In Flynn's Fall, Signs Of Potentially Deeper Problem In Trump's White House The spectacle of national security adviser Michael Flynn's sudden fall from grace is all too convenient a metaphor for the first four weeks of life in the Trump White House. 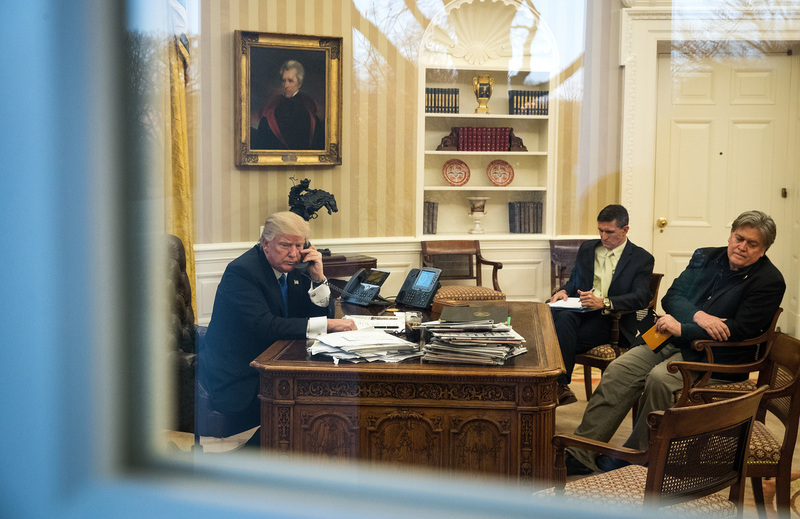 President Trump speaks on the phone in the Oval Office with now-former national security adviser Michael Flynn (center) and White House chief strategist Steve Bannon on Jan. 28. Everything that has happened surrounding Flynn's abrupt departure illustrates the larger troubles of the nascent administration. The president has made a great show of energy and excitement with a flurry of executive orders and meetings with foreign leaders. Yet the front pages were dominated by the backstory about the intense competition among the president's top aides for his favor and attention. Press secretary Sean Spicer said Flynn had lost the president's confidence because of an "erosion of trust." But an atmosphere of distrust pervades in the 2017 White House, bred in part by the personal rivalries and competing visions at the level just below the president. Who is speaking for the president? Among the contestants in the level below Trump are his son-in-law, Jared Kushner; his senior adviser Steve Bannon; his chief of staff, Reince Priebus; and various counselors and assistants including Kellyanne Conway and Stephen Miller (who appeared on four Sunday morning talk shows last weekend). While loyal to the boss, the top people are not loyal to each other. Magazines and websites, fed by leaked information, blare stories about which of the principal courtiers is up or down or on the way out. All presidential transitions have stumbles at the start, moments when they lose their balance. This White House has yet to develop a sense of balance to lose. You could say the new Trump team is not coming apart because it has yet to come together. The new White House has, however, kept up a running argument about appearances and reality, denouncing the media daily while working tirelessly to exploit them. The president turns to Twitter to denounce "illegal leaks" and insist they are "the real story." But the leaks spring from all levels of the executive branch and White House in a torrent. In other tweets we hear of "the lying media" and the "dishonest media" and learn that "all negative polls are fake news." Through it all, there persists a sense of the surreal. Who is actually speaking for the president when several officially do — and at times contradict each other? The president and his inner circle can find a replacement for Flynn among the many others who had been interviewed for his job or as prospective deputies to Defense Secretary James Mattis. Flynn's successor can take over immediately, needing no Senate confirmation. What is more important, and more difficult, is to find footing and focus on the real work that needs to be done. The heavy lifting to achieve the Trump agenda from 2016 must happen where laws are actually passed, on Capitol Hill. But there the Republican leaders, while loyally pushing the president's nominations past Democrats' resistance, have been frustrated by a lack of presidential attention. At the moment, the major elements of the Trump program — an infrastructure initiative, tax reform, repeal of Obamacare and the Dodd-Frank financial services law — are all stuck in the starting gate. The one point on which Republicans all agree, repealing Obamacare, has stalled on the question of replacement. The most fervent repealers are loath to wait until there is a replacement plan. Others insist the two must happen in tandem. Republican leaders on the Hill thought they had a truce among their troops until Trump told a TV audience on Super Bowl Sunday that the replacement would be in place in the next year or two. The internal battle was swiftly rejoined and now seems beyond control. Nearly four weeks in, the Trump regime has issued a record number of executive orders, largely devoted to rescinding the orders of former President Barack Obama. One of those orders sharply limited access to the U.S. for many noncitizens, especially refugees from war-torn countries of the Middle East and East Africa. The order was initially interpreted to apply also to permanent legal residents from these countries, causing massive confusion and at least temporary harm. When a federal judge, backed by an appeals court panel, put a stop to this "travel ban," the president was furious. He vowed to overturn the judges and prevail. He may pursue the fight in the courts or back down and revise his order. But that problem has seemed to be on hold since the Flynn story burst into the headlines last week. It is obviously a matter of priorities. Every White House faces many, and every decision to emphasize one implies the neglect of others. It is the kind of problem that demands the president have help, and that his helpers help each other. Philip Zelikow and Michele Flournoy have been among the scholars and officials studying the handling of crises in recent administrations for the "First Year Project" at the University of Virginia's Miller Center. They looked at five cases from the early days of the presidents from John F. Kennedy in 1961 to George W. Bush in 2001 and listed five key pieces of advice for new presidents. Two of the first three were about advisers: "Assemble a team of strategy-minded advisors who trust one another" and "Resolve differences among advisors." It is possible that when we reach the milestone of 100 days (a time frame of no actual significance that bulks large in myth and the media) the Flynn episode will seem aberrant and minor in hindsight. But here in mid-February, the spectacle of his sudden fall from grace is all too convenient a metaphor for the first four weeks of life in the Trump White House. Far from asking what Trump and his inner circle might accomplish in their first 100 days, the world now wonders which members of that inner circle will be around that long.